The smartness of nano-materials is attributed to their nanoscale and subsequently unique physicochemical properties and their use in glucose sensing has been aimed at improving performance, reducing cost and miniaturizing the sensor and its associated instrumentation. So far, portable (handheld) glucose analysers were introduced for hospital wards, emergency rooms and physicians' offices; single-use strip systems achieved nanolitre sampling for painless and accurate home glucose monitoring; advanced continuous monitoring devices having 2 to 7 days operating life are in clinical and home use; and continued research efforts are being made to develop and introduce increasingly advanced glucose monitoring systems for health as well as food, biotechnology, cell and tissue culture industries. 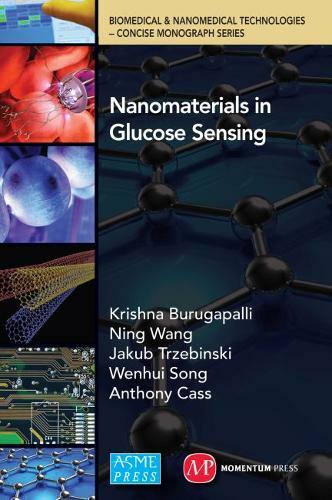 Nanomaterials have touched every aspect of biosensor design and this chapter reviews their role in the development of advanced technologies for glucose sensing, and especially for diabetes. Research shows that overall, nanomaterials help address the problems with conventional optical and electrochemical biosensors, by enhancing the preferential detection of glucose or its oxidation products through better electron transfer kinetics, sensitivity and response time, while lowering the operating over-voltages for energy efficiency and avoid interference. The reproducible production of nano-materials and nano-structures at low cost is vital for the successful development of nano-technologies for glucose sensing. Several products, especially, home glucose monitoring devices, use nano-materials, but the need for reliable long-term CGM is still unmet. Nano-materials and nano-technologies have an important role in achieving the long-awaited CGM technology.